Home / I Found Mrs. Wishy-Washy! I’m guest posting over at Hameray Publishing about one of my favorite Mrs. Wishy-Washy books. My original post is below and the fancied up version is over on the Hameray Blog. Enjoy!! 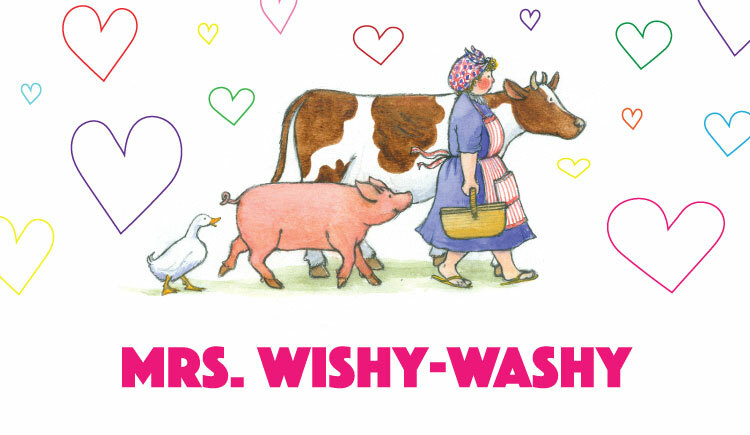 If you teach in the younger grades, pre-k through 2nd grade, I’m sure you’re familiar with the beloved Mrs. Wishy-Washy. Twenty years ago, when I first started teaching, I had many of the Mrs. Wishy-Washy books. I had big books for whole class lessons and 6-packs for small group instruction. Many of the books were purchased with a grant from the school, so when I moved schools I couldn’t take the books with me. My new school didn’t have the Mrs. Wishy-Washy books so I started looking online for them. Much to my dismay, the company that I had purchased them from the first time around had been bought by another company and I couldn’t find the books! For the past few years, I’ve been teaching with the few Mrs. Wishy-Washy and Meanies books that I own, which aren’t many. 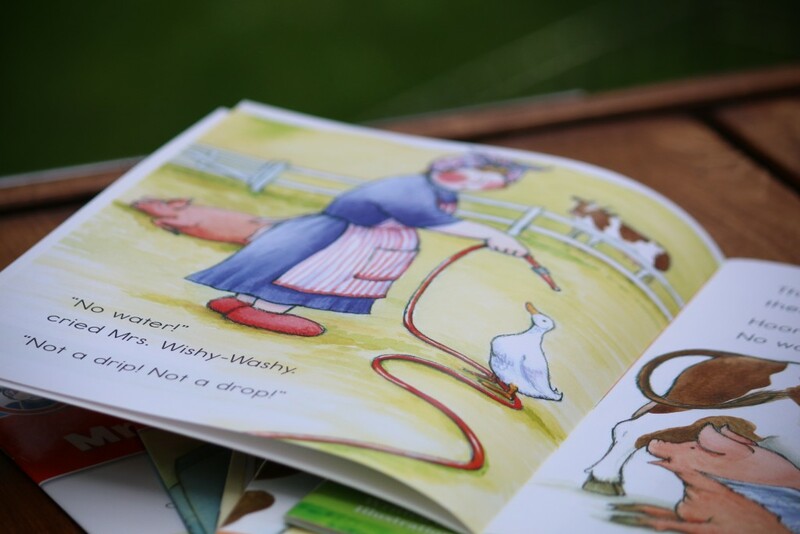 (If you aren’t familiar with the Meanie books, Mrs. Wishy-Washy makes a cameo appearance in those books.) 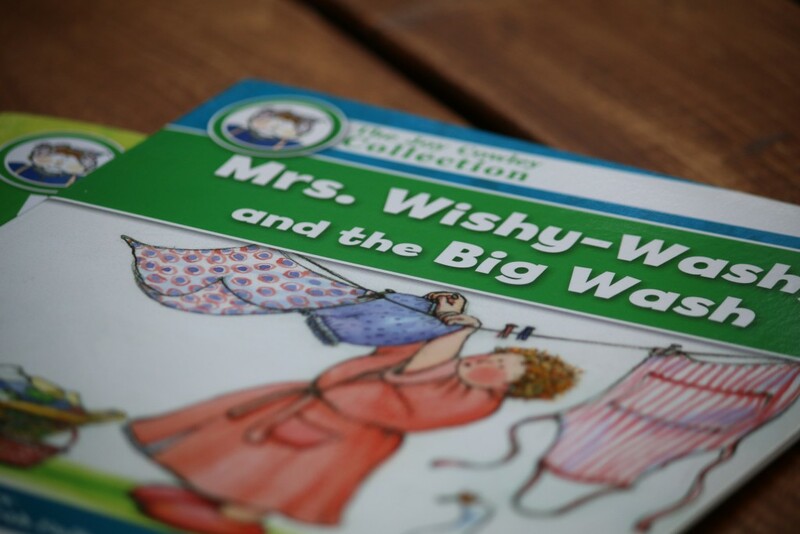 One day, I was browsing through some of my favorite literacy blogs and up popped a blog post about Mrs. Wishy-Washy! The books looked slightly different than my 20 year old books, and it looked like there was a new publisher, but I was THRILLED to find my favorite character again! Instead of just buying the books, I decided to take it one step further. I contacted the publisher and asked if they would be willing to send me a few books to review on my literacy blog. Just like that, 12 new books were in my mailbox and I get to tell you all about why I love Mrs. Wishy-Washy. If you aren’t familiar with onomatopoeia, it’s a game-changer when introduced during kindergarten Writer’s Workshop. The kids love adding “sound words” to their writing, and honestly, I think they just love saying the word onomatopoeia every time their hear another author use it in his or her writing. I’ll start by telling you a bit about the story. Mrs. Wishy-Washy is a bit obsessed with cleanliness. She likes things just-so. 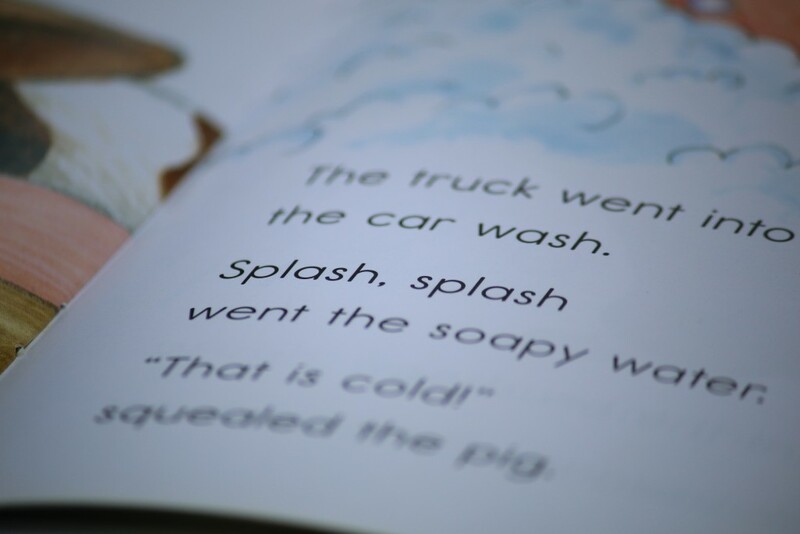 When it was time for the farm animals’ wash day, she was out of water and they had to search the town to find some. One of the GREAT things about this book is that it has Teacher Notes at the end of the book… hello, Guided Reading groups!! In my previous school district, we had an entire room dedicated to storing our Guided Reading books, but we don’t have those type of resources in my new district. I was describing the steps of a Guided Reading lesson to a teaching partner, last Spring, and was wishing our books had a tool like this embedded into them. The back page of the book gives the teacher suggestions for before, during, and after reading, and also has suggestions for making meaning, analyzing the text, and taking things to the next level. They call this Cracking the Code, and point out rhyming and compound words. Sigh… I think I’ve died and gone to Guided Reading Heaven. I’ll tell you a couple of different ways I would use this book in my ideal world. I love using big books in my classroom because kids can actually see the text and the illustrations, even if they are sitting at the back of the rug. One way to use this would be to do a whole group lesson with the big book version of the story. I would still use some of the before, during, and after reading ideas, but I would spread it out over 3-5 days of instruction. I love reading half of the book on the first day and saving the other half for the second day. Kids are absolutely begging for the second half of the story! By day 5, most of the kids are reading along with the big book and they are also able to read it on their own during our literacy stations. Another option for using this book, in my ideal world, would be to purchase 6-packs of the small versions of the books to have on hand for Guided Reading groups. The before, during, and after reading Teacher Notes at the back, are set up perfectly for small group instruction. Any way you read this book, I love the text features you can point out. Punctuation, rhyming words, onomatopoeia, and compound words are part of our every-day instruction in kindergarten. 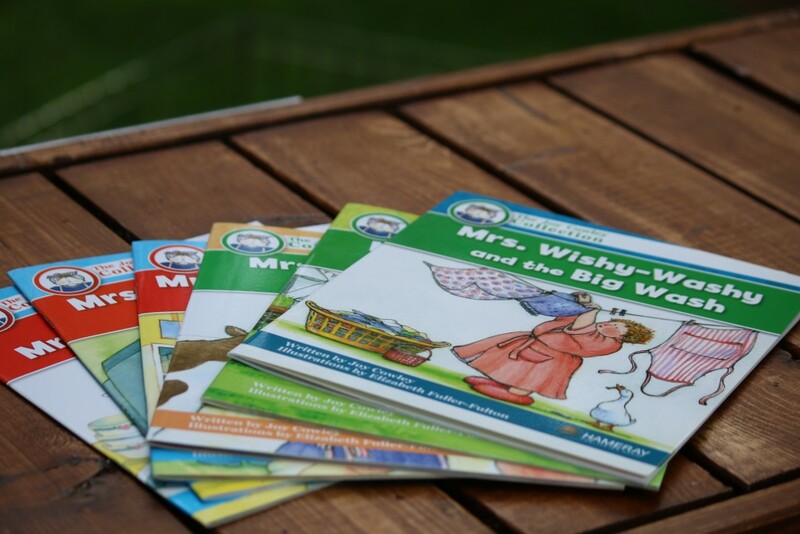 I’m so happy that I’ve found Mrs. Wishy-Washy again and I can’t wait to share some really fun ways to use these books in the classroom or at home with your little literacy lovers! Oh how I miss Mrs. Wishy-Washy! I miss her so much that I decided to bring her back to my classroom. 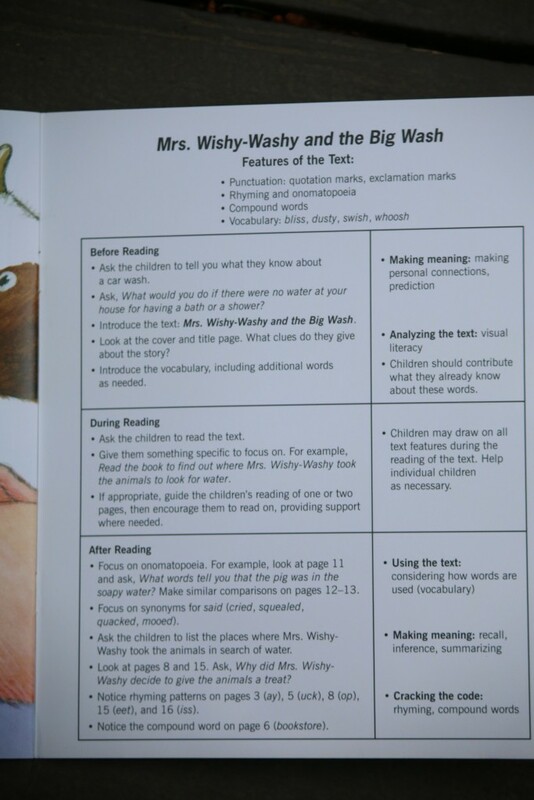 I am currently working on putting a whole thematic unit around Mrs. Wishy-Washy. I am asking my school to make a purchase of the some of early readers big book collection from Hameray Publishing Group and I am also purchasing other big books from eBay. Teachers Pay Teachers has great activities around Mrs. Wishy-Washy too. Looking forward to bringing the love of big books back to our students. Mrs. Wishy-Washy will help l do the job.